Temple and its ancient Tower Pagoda. First : Pass NanTang or South Cathedral at XuanwuMen intersection following XuanwuMen DongDajie, turning into XuanwuMen XiDajie (Xi=West) on your way to the West. If you are on the correct Bus Line (exact numbers will be mentioned here later) the Bus will automatically take you to the West, moving onto a very large overpass and crossing of the highway and some waterways. 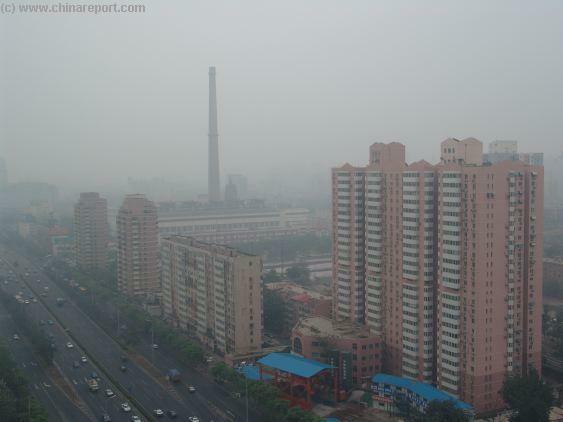 You should see the large Beijing Central Conservatory complex right and East. If you are in a Taxi (or Bus) make sure you do not turn North continuing on the 3rd Ring Road !! From here things are easy and it is only a short way to the vicinity of the Temple and Pagoda. From the large Overpass named TianNing Overpass continueing West XuanwuMen XiDajie will change it's name to LianHuachi DongLu, after crossing over the large overpass and waterways. When on the left (and South) an electrothermal plant comes into view, get out of your Bus. Direct your taxi to move North and get out on the North Bank of big LianHuachi Donglu. TianNing Buddhist Temple, in the South-Western Fengtai district of Beijing, once an outside village, is one of the cities under-appreciated monuments and mostly undescribed by tourist agencies, books and websites. 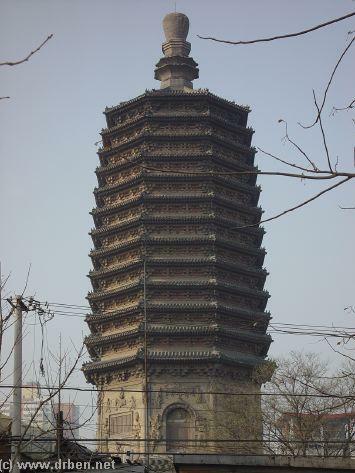 This is China Report's historic description of this unique 13 story stone pagoda and affiliated Temple buildings, together the oldest structure in Beijing. 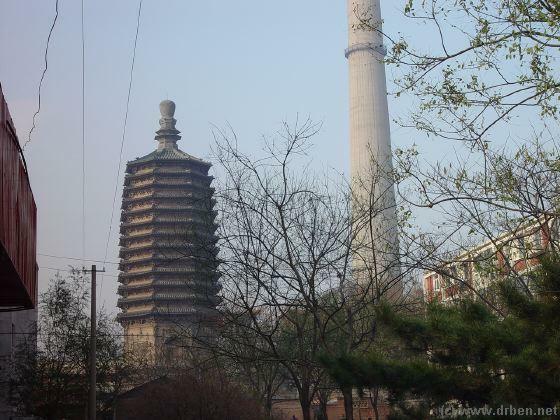 How to find TianNing Temple & Pagoda : Located just across the Xuanwu Border in a small corner of Northern Fengtai District , just outside the 3rd ring road, TianNing Temple is not easy to find. Not long ago many locals would not have heard of its excistence. Follow the instructions in this small short Introduction to this Jewel of a Hidden Tower Pagoda and find your way to the spot. South, is not the right direction. The Feng Shui basics demand we must approach the Pagoda from the South side to find its Entrance. 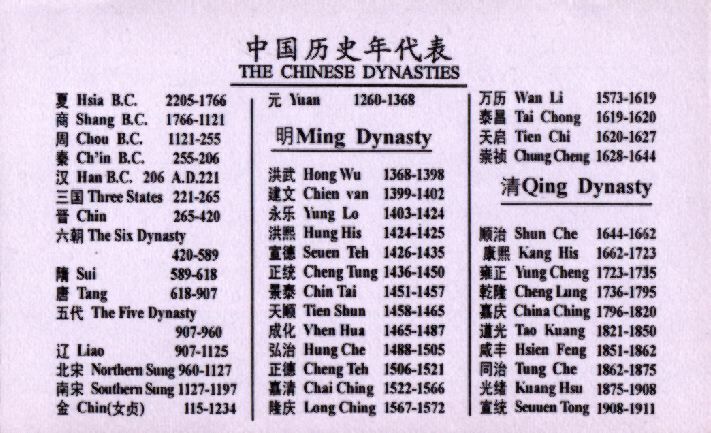 Therefor, turn left (and East) the first chance when emerging from LianHuachi DongLu. 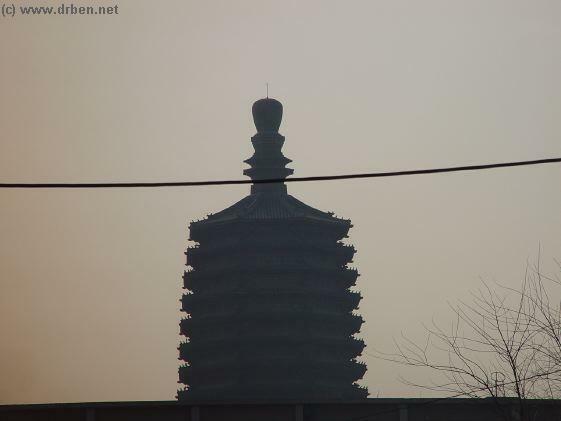 The Destinct Figure of the 13 Story Tian Ning Pagoda crowned by it's large Pearl as visible from afar on the South Beijing Skyline. Since the year 2003, TianNing Temple has been under renovations in preparation for the 2008 Olympics. When we visited in November 2004 to document The Temple shortly before its opening the Temple was expected to be operational in early 2005. View all results from our 2004 Photo-shoot at TianNing Temple further on and read more details about TianNing Temple and Beijing History in this Report. For a Preview of the Temple during reconstruction in 2002, click through to the next page. 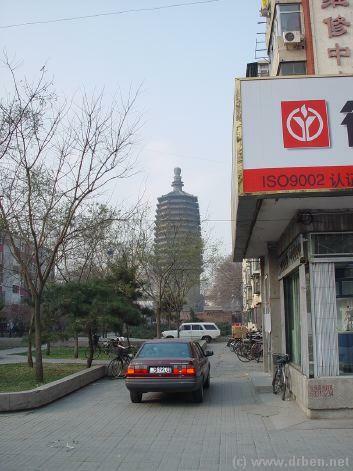 At this point you should be standing at the corner depicted to the Right, in sudden full view of the 13 Story Pagoda --> towering over its surrounding Hutong. Follow this road leading West and pick your way to the Pagoda. It is a narrow passage through a small bit of Hutong Alley at the end of this road which will lead you South and land you exactly in front of TianNing Temple's Main Gate. NanTang, the South and Main Cathedral of Beijing at XuanwuMen. The originally Jesuit Cathedral dates back to the 16Th Century and father Verbiest, known from the Observatory. 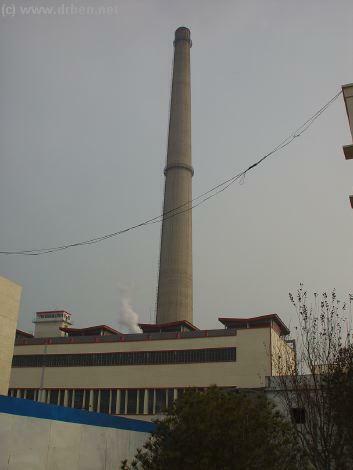 Moving from the intersection of LianHuachi with ShouPakou to the South, stay North of the electro-thermo plant and head back in the direction of the city and the overpass. 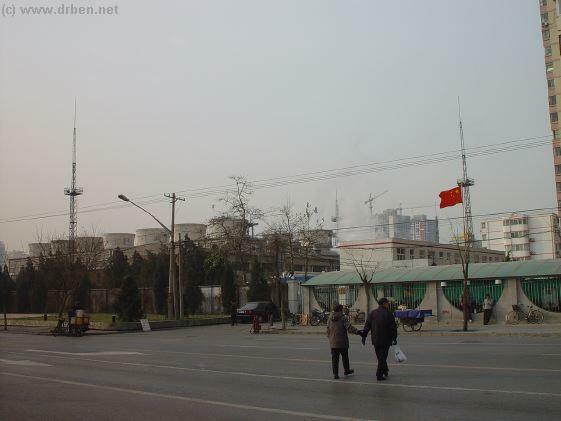 After you pass in front of a Karaoke Bar, the scenery will slowly turn into Hutong and some more modern buildings. Follow the street untill it curves towards the South. 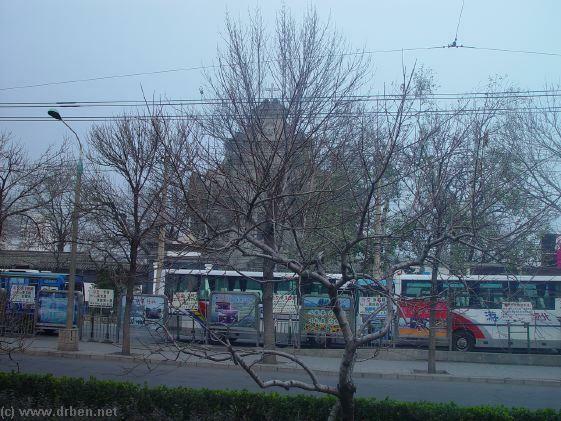 This is Guang'anMen BeiBinHelu, a road leading around hutong and Temple, leading onto the highway more southernly. Turn the 1st corner to the right and East. This is fairly at the beginning at intersection FuWai Street. It is impossible to view TianNing Pagoda from here, but one is confronted with a large and wide boulevard with abundant traffic. Reorientate yourself. If you have travelled too far west on LianHuachi, you may find yourself at Beijing Security University. We haven't gone that far yet ourselves, but the Security University, belonging to The (Beijing) China Peoples Public Security Bureau should be easily recognisable. We expect a big building with lots of flags, undoubtedly guarded and perhaps with some other uniforms around. Possibly Stalinistic style. 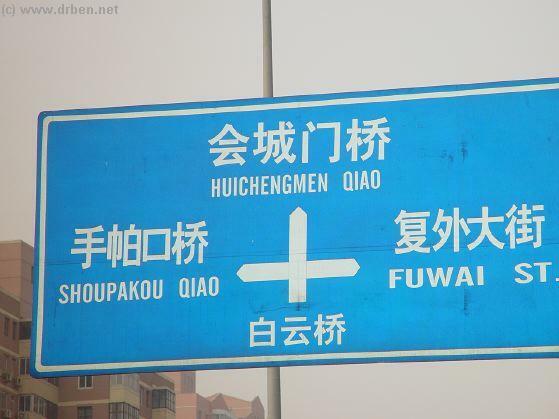 Street sign designating ShouPaKou to the South, Fuwai (not on all Maps) to the North. Corner at Guang'AnMen BeiBinLu, looking West towards The Temple. 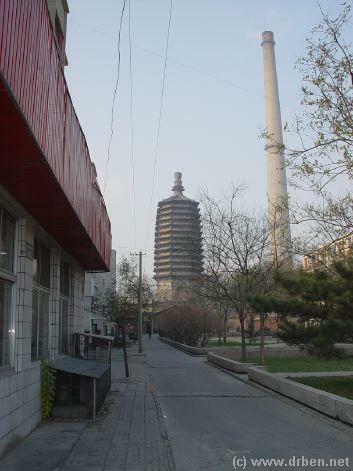 Down the road- Temple Pagoda and Chimney of Electro-Thermal Plant. 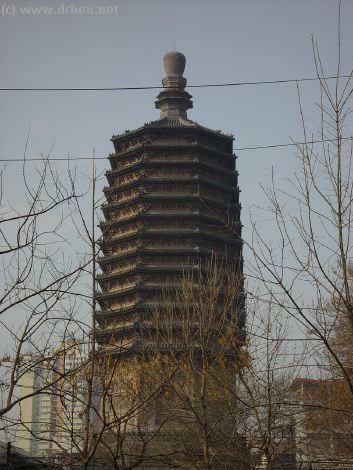 Some of the Best Views of the Pagoda Tower, from the Hutong at its South-Eastern flank. TianNing Temple overpass (in Green) depicted on a stamp. 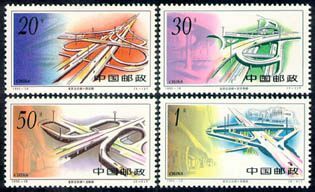 Series Beijing Highway Overpasses, by China Post, 1995.
now called Fengtai District. TianNing Temple truely is a unique Pagoda with its marvelous Octagonal Design. The entire pagoda's stone brick-work, made to resemble traditional layered wooden carpentry, is one of China's 32 most treasured Pagoda's. It is now a State Level protected Cultural Relic. Closed to the Public for a long time, and in need of restoration, TianNing Temple was first visited by China Report in the year 2002. In 2004 we returned for a visit to the Temple still under reconstruction, documenting it pre'-opening for use of History and photographing the Temple's original details. 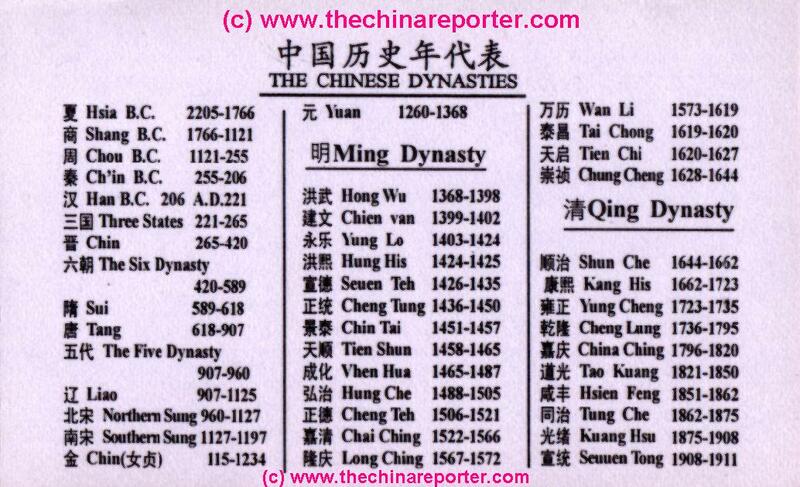 Handy List of All Dynasties throughout Chinese History. 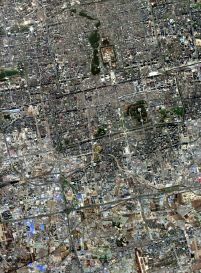 A Satellite Image overviewing Beijing Center, a large part of Xuanwu District, the above described route, with Tianning Temple Overpass and Fengtai in the Bottom-Left section of the Image / Map. Selected spots marked on Map with links to Report Pages. Overview of Luanhuachi DongLu with apartment blocks, thermo-electric plant and Tianning Temple hidden in between. This sounds rather easy but becomes lot less clear once one arrives at LianHuachi DongLu, which resembles a 6 way highway and has plenty of highrise buildings along it, taking away much of the view of any nearby Pagoda's. At this point you might feel lost. The nearby White Cloud Temple (BaiYunGuan) is easier to locate, just North and up the road from here. <- Adjacent photo should give a better idea of the local situation. Basicly, keep near the overpass of the second ring road which brought you outside of Beijing's Old City. Stay near the exhaust pipe of the local factory and follow the water from underneath the TianNing second ring road overpass to head for the Temple and Pagoda. The water is back the way you came, running underneath the overpass to turn southwards at this point.